We present Fireflies, an exploration of bio-inspired visualization using animal swarming behaviours and plant phyllotaxis. We ap-plied Fireflies to a Canadian attitudinal survey on HIV/AIDS. In-formation about the survey participants is encoded within different visual elements of fireflies; most importantly, the motion of the fireflies depicts comfort levels concerning HIV/AIDS. 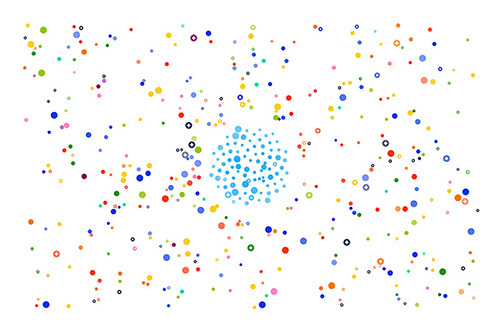 The bio-inspired visual properties of Fireflies meld into an expressive repre-sentation of a sensitive dataset. Fireflies was also included in a group art show, "Murmuration," at the Herringer Kiss Gallery (September 8–24, 2016). Bon Adriel Aseniero, Charles Perin, Marjan Eggermont, Sheelagh Carpendale. 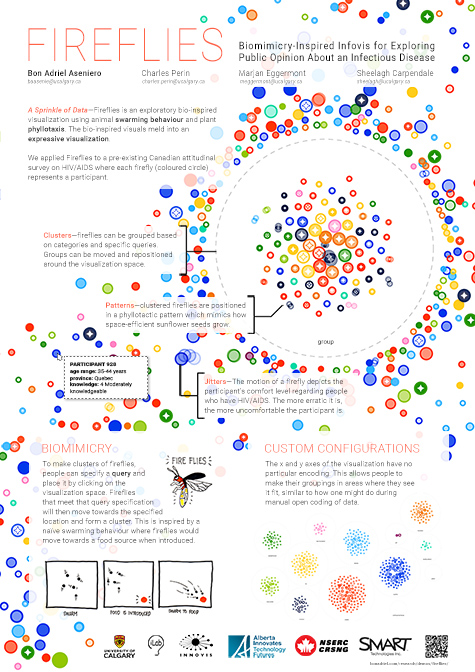 Fireflies: Expressive Infovis Inspired by Biomimicry. In Demo, IEEE VIS 2016 Arts Program (VISAP'16 Metamorphoses). IEEE, 2016. Bon Adriel Aseniero, Charles Perin, Marjan Eggermont, Sheelagh Carpendale. 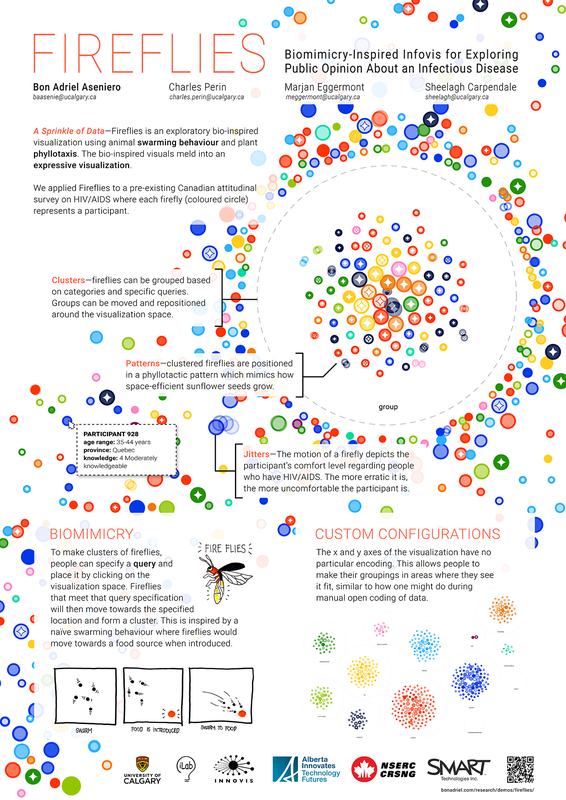 Fireflies: Biomimicry-Inspired Infovis for Exploring Public Opinion about an Infectious Disease. In Poster Session, IEEE Information Visualization (InfoVis 2016). IEEE, 2016.